Living in the Pacific Northwest, you can never be sure about the weather form one day to the next. Driving on slick, rain-soaked roads is a possible hazard. 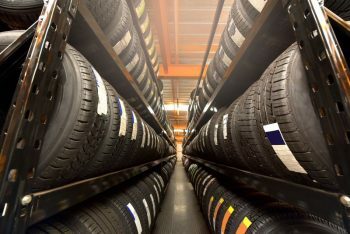 What do you need to know about buying rain tires in Portland? Learn not only about seasonal driving, but also tires in general and where to get the best deals and service in the area. If you’ve never researched tires, you might think that they’re complicated. Did you know that just one glance at those numbers and letters in a tire’s sidewall can tell you everything that you need to know? For instance, let’s consider a hypothetical tire, with service descriptions and ratings of 245/70 R17 110T. Note that the first section “245/70” is a measure of certain aspects of the size of the tire and doesn’t affect performance overall. 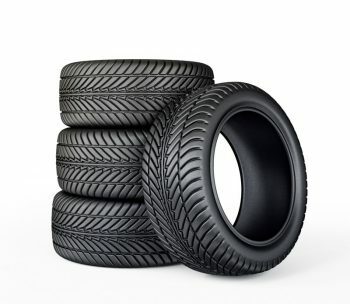 “R” means that the tire features radial construction, and is the most common type. Size: Looking at the 245/70 R17 110T, the “17” in the “R17” section is the size of the tire. a size 17 tire fits on a 17-inch wheel, a size 16 tire fits on a 16-inch wheel and so on. Speed rating: The speed rating of the 245/70 R17 110T is the “T” at the end. It’s a measure of the highest speed at which you can safely handle a car equipped with these tires. In the case of “T”, it’s 118 mph, which is more than sufficient for most sedans and crossover vehicles. Generally, higher letter ratings mean higher speeds, the exception is that H (130 mph) comes between “U” (124 mph) and V (149 mph). Z means a maximum speed of over 149 mph, and W and Y are rated even higher. Load index: The load index in our 245/70 R17 110T example is “110” before the “T”. This rating shows how much of a load the tire can safely bear. A higher number always means a greater load capacity. Be sure that you get tires with a load rating at least equal to the specifications from the vehicle’s manufacturer. Also note that the speed rating is listed under optimal conditions, a dry, asphalt road. The top safe speed while driving goes down dramatically in the rain, snow or on ice. To get around in Portland and other wet areas, you want to make sure that you have sufficient traction. Further on down the sidewall from the service description, a tire has a Traction rating. This is a letter grade that goes in ascending order from C to B, A, and AA. It tells you how much traction the tire generates when it stops on a straight, wet surface. While it doesn’t rate handling on a curve, you can get a general idea of how well a tire performs in the rain by its traction rating. A seasonal designation gives you a well-rounded snapshot of the conditions under which a given tire delivers its optimal performance. While we do have some hot, dry summers in Portland, weather conditions can change from day to day. Summer tires work fine on dry roads, but there are much better options for driving in a monsoon. To deal with Oregon’s wet climate look for tires that are rated for all-season or winter driving. These models tend to have grooves that channel water away from you and they handle better under conditions that would normally make other tires slip. So now that you know what you need, where do you go to get them? 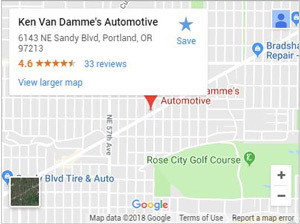 Ken Van Damme’s Automotive is your top choice. We’ve been in business for decades and know what our neighbors need. Our large stock of tires includes everything, from summer to winter, off-road and more. We carry all of the major brands and can get you virtually any tire on the market. Here at Ken’s Automotive, we run a team that has years of experience. We listen to your needs and work with you to find tires that suit your budget as well as your driving needs. Installation is free and fast so you can get back on the road quickly. Once you have your set from us you can keep coming back to us for complimentary tire rotation. This service reduces wear on the treads so you can go longer without having to buy a new set. Ken Van Damme’s Automotive goes beyond what the other guys do. Besides tire sales and service, we’re also a complete mechanical garage. You can come to us for all of your regular maintenance. Let us take care of the oil change, alignment adjustment and a tune-up while you shop. You can pick out your tires and drive out of the shop in top shape. Our service goes beyond simple maintenance. We can fix damage from collisions and replace major systems when they fail. If you ever find yourself on the side of the road, we also run a towing operation. From an accident to the repairs, we’re there for you every step of the way. If you need to get new tires, walk-ins are always welcome. If you have any questions feel free to give us a phone call or use the contact form on this site and we’ll get back to you promptly. Our master technicians explain everything to you using regular English in a way that makes sense. After your appointment with us, you have a clear picture of what you need and what we’re doing for you. Give us a call today to get yourself set up for driving in the rain with all-season tires from Ken Van Damme’s Automotive.